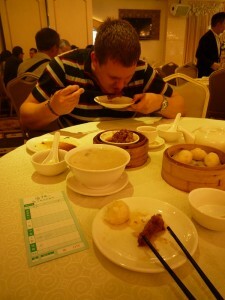 Hello from Hong Kong, the city where the AVAR Conference 2011 is taking place. We, Lukas and Jan, are here to make a presentation on "Google Image poisoning". We arrived to Hong Kong on Monday after a long flight from Prague. From the moment we got off the plane we knew that Hong Kong is completely different from what we are used to in Prague. Not only is the weather different - winter in Prague but summer in Hong Kong - the cultures are also completely different. I think that it would be unfair to try to compare Asia to Europe, so let's move on. We were hungry when we got to our hotel and so we went for lunch. The lady at the Wharney Guang Dong hotel recommended us to a dim sum restaurant across the street. Well, I have to admit that it was really good advice. The place was spectacular and the food was delicious. We even ordered something called "duck web". However, what we received wasn't a web at all. As you can see on the picture on the left. Honza (Jan) has a duck leg. It was quite a new experience to both of us, but... where is our web? OK, let me make a long story short. We have a presentation at the AVAR conference at about Google Image poisoning. And there is a close connection between duck web and the poisoning. But, let me tell you, it's quite difficult to write an article after midnight when you have jet lag and also after a welcoming drink with all the AVAR members. -- So let me just fix the first sentence - there is a close relation between web and Google Image search poisoning attacks but ... we'll tell you more tomorrow after our presentation.